The feeling of blocked ears is often caused by one of three things: glue ear, what's called eustachian tube dysfunction, or waxy ears. 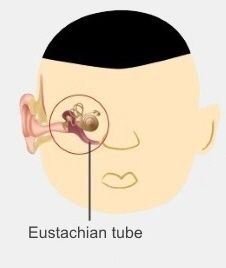 The eustachian tube is a tube that runs from your ear to your nose and mouth. It is normally closed, but opens when you swallow or yawn. This lets air into your middle ear. If your eustachian tube isn't working properly, this causes reduced air pressure in your middle ear, which pulls your eardrum inwards. This can make your ear feel blocked and may cause ear pain. These symptoms usually get better on their own, within a few weeks. If they don't, it may help to treat whatever is causing the problem. Common causes include a blocked nose (caused by a virus, allergies, or smoking) and enlarged adenoids. Air travel and scuba diving when you have a cold can make eustachian tube dysfunction worse. If you have symptoms of eustachian tube dysfunction, try closing your mouth, holding your nose closed and blowing into your nose (this is called the Valsalva manoeuvre). You may hear a clicking sound in your ears. If your symptoms don't get better, see your doctor. There may be another cause of your pain, such as middle ear or outer ear infection, or an inner ear condition. A detailed explanation of what the eustachian tube does, the symptoms and causes of eustachian tube dysfunction, and what to do about it. This page explains the different methods for removing excess earwax. Written by HealthInfo clinical advisers. Endorsed by clinical director, Otolaryngology, Canterbury DHB. Last reviewed October 2016. Murtagh, John (2011). John Murtagh's general practice, 5th edition, McGraw-Hill Australia Pty Ltd.